A little late post this, but I've been out of the loop the last few weeks. 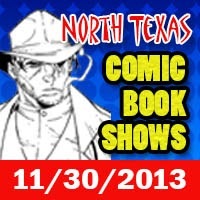 The North Texas Comic Book Show is this Saturday November 30, 2013, at the Doubletree Hotel Dallas Market Center from 9:30 AM until 4:00 PM. There will be a cosplay contest and there will be no admission. That's right. IT'S FREE! So, come work off some of that turkey by walking the tables and doing a little Christmas shopping or just a little browsing for yourself. I'll have a table selling new and used books. We'll see you there.